Bariatrics Get Started - Am I Hungry?Am I Hungry? The Am I Hungry?® Mindful Eating Program for Bariatric Surgery is offered in several learning formats. Decide which one fits your schedule and lifestyle! Resolve the mindless habits and emotional eating issues that lead to problems after bariatric surgery. Am I Hungry? 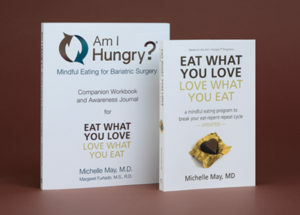 Mindful Eating for Bariatric Surgery Workshops combine the benefits of our innovative mindful eating approach with the interaction, motivation, and support of a group led by trained Am I Hungry? Facilitators. Click here to find an Am I Hungry? Mindful Eating for Bariatric Surgery Workshop or Facilitator near you. Can’t find an Am I Hungry? Mindful Eating for Bariatric Surgery Program in your area? Do you travel or have difficulty getting away from the house? Do you prefer the convenience, privacy, and comfort of participating in a workshop from your home or office? Participate in a Mindful Eating for Bariatric Surgery workshop from your computer and/or telephone. Am I Hungry? Mindful Eating for Bariatric Surgery webinars and teleseminars are just like our workshops: same eye-opening content, same innovative materials, same great instructors, and same live interactive format. The only difference is that you log in or call in to participate with your live group. It’s a great way to fit this life changing information into a busy schedule.